Years ago, Mom gave me a stack of family recipes, full of gems like buttermilk cornbread, walnut fudge, and seafoam icing. Tucked away in that stack was a recipe for the descriptively named "Chewy Nutty Cookies." It had always looked like a simple recipe, but one that had never grabbed me because of the presence of pecans. Traditionally, I object to nuts in cookies. Sometimes, I'm a fool. Before Mom & Dad got married, Mom was living with her mother. They saw this recipe on an egg carton and decided to make them. Mom remembered them being good enough to save the recipe, but hadn't made them since 1972. Until last fall. 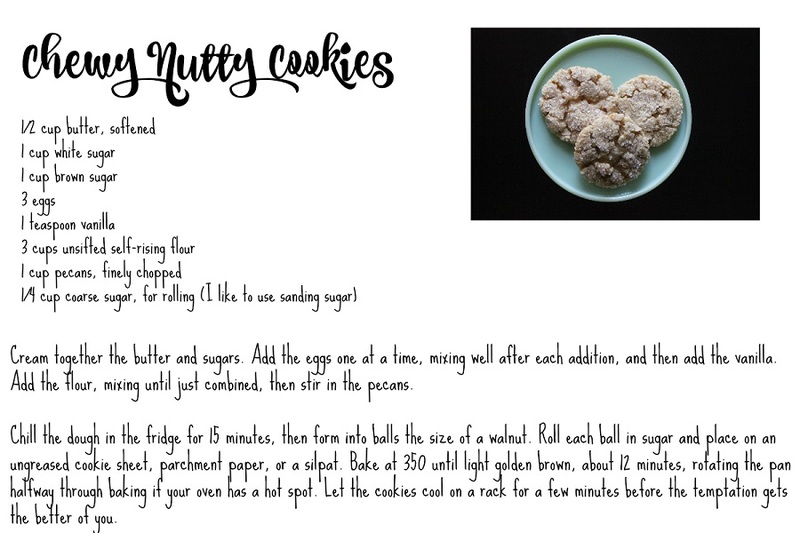 As the name implies, this cookie is both chewy and nutty, but because the pecans are nearly ground--I use my food processor to chop them to a fine grind, slightly finer than what you find in baklava--they give more structure to the cookie than chunks of nuts throughout the dough. A roll around in sugar doesn't hurt. They're the perfect cookie to round out your cookie repertoire.